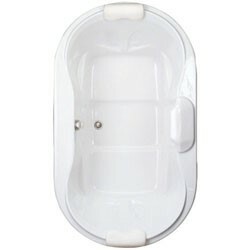 The Hampton OV is a unique oval tub with a deep bathing well that will enhance any bathroom decor. Includes one pillow and two decorative handles. Available as a soaking tub, air tub or whirlpool tub. Call 800-720-1062 for more details. 68" x 42" x 23.5"
Dimensions: 68" x 42" x 23.5"